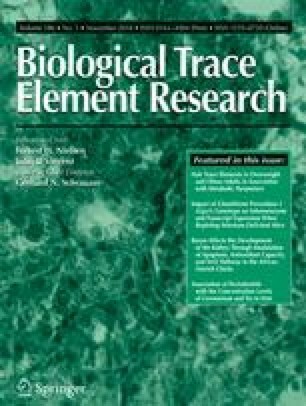 The purpose of this study was to investigate whether or not the concentration levels of certain kinds of trace elements in hair are associated with periodontitis. We studied a total of 109 participants, which are composed of 25 participants with periodontitis and 84 participants without periodontitis. Periodontal conditions were assessed by measuring the periodontal clinical attachment loss and pocket depth, which were determined at six sites of all teeth. Periodontitis was defined according to the criteria of periodontitis proposed by CDC-AAP. The hair samples were washed with acetone, water, and extran (1%v/v), and then aliquots of hair samples were wet-ashed. This sample solution was analyzed by Perkin-Elmer Mass Spectrometer. The odds ratios and 95% confidence intervals of the concentration levels of trace elements for periodontitis were calculated by multivariate logistic regression analysis. After adjusting all confounders, it was found that the higher concentration level of germanium in hair was significantly and positively associated with periodontitis (odds ratio [OR] 7.12; 95% confidential interval [CI] 2.03–25.00). The higher concentration level of tin in hair was significantly and negatively associated with periodontitis (OR 0.27; 95% CI 0.08–0.94). It was concluded that there was a significant relationship between periodontitis and the concentration level of germanium and tin in hair. Hye-Sung Kim and Hyun-Jae Cho contributed equally to this work.